I love the summer and I’m never ready to see it come to an end. I LOVE the hot weather, the pool, being outside so much and having a good cookout or picnic with friends and family. I have so many wonderful memories of summers past! But this summer is quickly coming to a close. I wore a long sleeved shirt today AND a sweater… it’s WAY too cold for the end of September in my book! BUT… I do have to say, once the fall is here I enjoy the fall things too! I love the winter squash, warm fires, hot coco, pumpkin pies, apple crisp, apple sauce and all the other yummy foods of fall! And there was a hint of it in our boxes this week and I think it’s only going to get stronger through the next month! We did still have lots of corn and tomatoes, which I love, but I’m actually kinda over for the year! I almost feel guilty saying that because it is such great food, it’s just getting a bit redundant! But that’s ok! We won’t be chomping on fresh corn on the cob, heirloom tomatoes or warm summer squash all winter and we will be VERY ready when the season returns next year! So an overdose now is good since we won’t get a taste for quite a few months! Enjoy it now!!! Corn – This evening I cut the kernels off the ear of corn and sauteed them on high heat with a little salt and pepper. I then let it cool and added freshly chopped tomato, onion and cilantro and it was a delicious fresh salsa with dinner. It really was good and we were heaping it up on the chips! I’m planning on doing again this week since we have lots of both corn and tomatoes. Tomatoes – I’ve made a few batches of tomato sauce and don’t really need to make anymore although I think today we had 15+ in our box. I’m gonna have to work hard to eat them before they go bad if I don’t freeze them! I’m also thinking of making a large batch of chili this week since it’s cooler and I could use the fresh tomatoes instead of the sauce. So that might be on the books too! Zucchini – Alyssa and Christine are sisters and both pick up their CSA boxes from my house. Last week Alyssa posted on her blog a recipe that Christine had created. It’s called Paleo Smooth Veggie Soup. I haven’t made it yet, but it looks really good and I have it on my menu list to try this week. It really looks fantastic and I’ve never had ANYTHING that isn’t amazing coming from the kitchen of Christine! 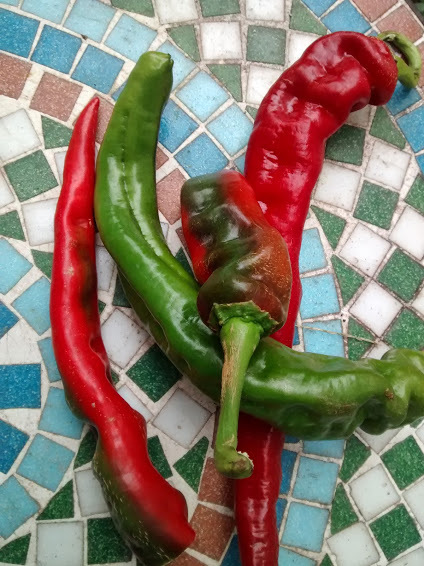 Cayenne peppers – These are hot peppers although on a scale of one to ten they only rate at about a 3. They are a bit peppery raw, but once they are cooked the flavors come out and the temperature lessens. Also if you remove the ribs and seeds it lessens the heat you get from them significantly. I do plan on adding some of these to my chili this week and what I may not get to, I plan to string on a piece of dental floss and let them dry in my kitchen window to use later this winter. Hungarian wax peppers – These are hot peppers too and on the same 1-10 scale I’d say they are about a 2. Really not that hot at all. Christine’s soup calls for a jalapeno, but I plan on putting a few of these in to give it a pepper flavor, but not too much spice… I do want my kids to eat it! I like hot foods and Brian likes crazy hot sweat pouring down your face heat with his peppers and hot sauce. I’m not that crazy, but I do eat most ethnic foods at their recommended temperature. All that to say I think these ratings are pretty fair even for those who don’t like a lot of hot spice in their foods. 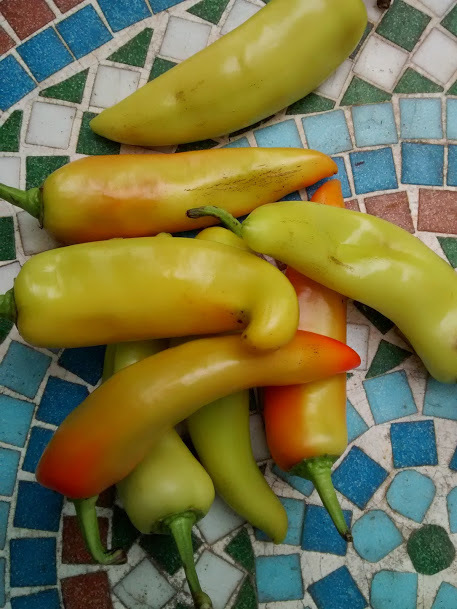 Green peppers – I’ll probably add a few of these to my chili, it really is great to just throw what you have into the chili and it still works out just fine! I do like to add lots of veggies and sometimes even zucchini and squash. It gives a nice texture and it adds more nutrients. As it cooks down it becomes a nice thick consistency and not chunky like veggie soup. Cucumbers – These are always nice for a quick snack or a veggie to add with lunch. Lately since school started we’ve been on the run and have had to pack a few lunches on days that we are out past meal time. These are a perfect fresh crispy snack or addition to our noonday meal. They are easy to prep and pack and thankfully my kids LOVE them even with out dip. And no dip makes the packing that much easier! Peaches – I didn’t think we would be getting any more of these, but we were pleasantly surprised! My kids are still going crazy over them and not a day goes by that they aren’t begging to eat one. In fact…. Each kiddo had ½ a peach with their breakfast and ½ a peach with lunch and then they wanted peaches for afternoon snack and then were asking for them for dessert too! These will be sorely missed as the season draws to a close. So there you have it! 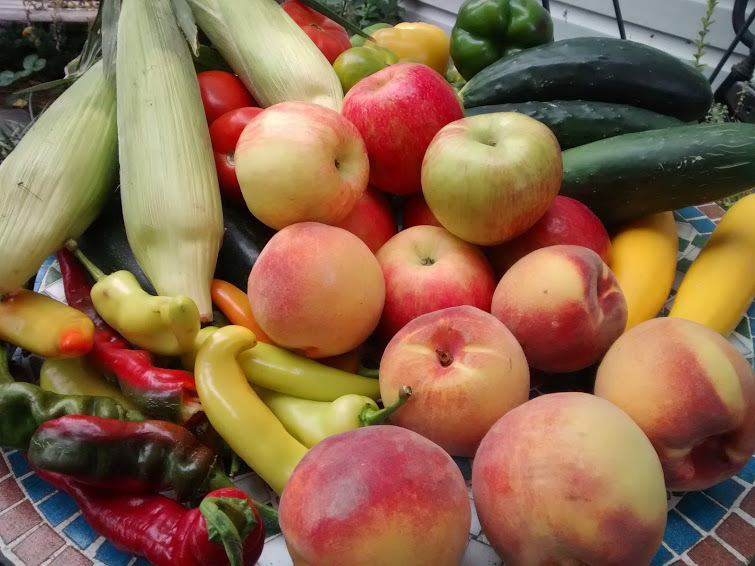 Another week of fruits, veggies and nutrition from our AWESOME and VERY generous farmer!